On May 29, 1453, the ancient Roman city of Constantinople was conquered by the Ottoman Turks. Many historians consider the event – and this day – as also marking the end of the Middle Ages and the beginning of Europe’s early modern period. Five hundred and sixty-three years ago today, an Ottoman army led by Sultan Mehmet II did what no other Muslim commander or army had been able to do for centuries. Not only did the Turks capture the “Queen of Cities,” but also effectively dissolved the last remnant of Eastern Roman – also known as Byzantine – rule and brought an end to one of the greatest empires the world has ever seen. The conquest paved the way for the growth of the Ottoman Empire and spread of Islam in the Balkans; it also affected the course of human history in ways which can still be seen today. When Constantinople fell Christopher Columbus was just a baby in Genoa, but the conquest of the city would play a strong role in his legacy. European kingdoms heavily relied on Constantinople for much of their trade, as the city was the commercial link between Europe and the Silk Road. At that time, much of medieval Europe’s economy was dependent on the spices, silk and gold coins coming in through this trade route. After conquering the city the Ottomans consolidated their power across the Middle East, practically ending Christian Europe’s access to the Silk Road. Europe started experiencing a recession. The demand for goods coming from Asia increased. A solution was needed. The Portuguese came up with the idea of reaching East Asia, known then as the Orient, by sea. Going on the basis of what they knew about the world at that time, they planned to sail east around the horn of Africa to reach India and China. It can be argued that the conquest of Constantinople practically started the Age of Exploration. Columbus had a different idea…why not sail west to reach the Orient? The commonly repeated idea that the majority of people in the period believed the world was flat is false. It had been theorised since the time of the ancient Greeks that the world was round. Columbus sold the idea to the two rulers of Spain at the time, Ferdinand and Isabella, and with their financial support set sail in August 1492. His ships did not lower their sails again until they reached the New World. Interestingly, the Byzantines believed in a prophecy that predicted the end of the world would be in 1492. The Byzantine Empire ended in 1453, but in a way Columbus’s discovery of the New World really did end the old one. 330 AD: Roman Emperor Constantine I relocates the capital of the Roman Empire from Rome to Byzantium and renames the city Constantinople. 413-414 AD: Theodosius II orders the construction of 18-metre (60-foot)-tall triple-wall fortifications, which weren’t breached until the introduction of gunpowder. 537 AD: Hagia Sophia is built. Upon seeing its magnificence, Emporer Justinian proclaims, “O Solomon, I have outdone thee!” Hagia Sophia was served by 600 people including 80 priests and cost 20,000 pounds of gold to build. 1182 AD: The Massacre of the Latins (Roman Catholics) by the Eastern Orthodox population of the city further worsens relations and increases enmity between the Western and Eastern Christian churches. 1197 AD: Constantinople is struck by a severe fire which burns down the Latin Quarter and the area around the Gate of the Droungarios on the Golden Horn. 1202 AD: The Fourth Crusade sacks Constantinople. Crusaders loot, terrorise, and vandalise the city for three days. Many ancient and medieval Roman and Greek works are either destroyed or stolen. Legendary bronze horses from the Hippodrome are sent back to adorn the facade of St Mark’s Basilica in Venice, where they remain. Works of immeasurable artistic value are destroyed. One of the most valuable works of art to suffer such a fate is the giant bronze statue of Hercules. The great Library of Constantinople is also destroyed. Crusaders stole or destroyed all they could lay their hands on, even the tombs of the emperors inside the St Apostles Church were looted. Thousands of civilians are killed. Women, including nuns, are raped by the Crusaders. Churches, monasteries and convents are sacked, altars of these churches are smashed and torn to pieces for their gold and marble. The sacking of Constantinople in 1204 is a blow from which Byzantines never fully recover. 1261 AD: After 57 years of Crusader rule, the Byzantines retake their capital. 1453 AD: The city is besieged and captured by Ottoman forces led by Mehmet II. Under the Ottomans the city was called both Konstantiniyye and Istanbul in Turkish. 1459 AD: The construction of Topkapi Palace begins. It would serve as the primary residence of the Ottoman sultans for almost 400 years. It is now a museum and a major tourist attraction. It also contains important holy relics of the Muslim world, including the Prophet Muhammed’s cloak and sword. 1460 AD: The Grand Bazaar, one of the largest and oldest covered markets in the world, is built. It has been listed No. 1 among the world’s most-visited tourist attractions with 91,250,000 annual visitors. 1509 AD: A devastating earthquake strikes Istanbul. A tsunami and 45 days of aftershocks follow the quake. Over 1,000 houses and 109 mosques are destroyed, and an estimated 10,000 people die. 1918 AD: Allied forces occupy Istanbul in accordance with the Armistice of Mudros, which ended Ottoman participation in the First World War. Along with the occupation of Izmir, this mobilised the establishment of the Turkish national movement and led to the Turkish War of Independence. 1923 AD: The occupation ends and city became part of the newly formed Republic of Turkey. The capital is changed from Istanbul to Ankara. Painting by Gentile Bellini depicts Mehmet the Conquerer. Mehmet II was born on March 30, 1432, in Edirne, the capital of the Ottoman Empire before the conquest of Constantinople. In August 1444 his father Murad II abdicated the throne to Mehmet. He was 12 years old. During Mehmet II’s first reign as sultan, a series of battles took place between 1443 and 1444 known as the Crusade of Varna. At this time, Mehmet asked his father Murad to reclaim the throne, but he refused. Angry, Mehmet wrote a letter to his father saying “If you are the Sultan, come and lead your armies. If I am the Sultan I hereby order you to come and lead my armies.” After receiving the letter, Murad returned to lead the Ottoman Army and won the Battle of Varna in 1444, ending the Crusade of Varna. Murad II then returned to the throne. Mehmet ascended to the throne again in 1451. His first order of business was to strengthen the Ottoman Navy and make preparations for conquering Constantinople. His great-grandfather Bayezid I had built the fortress of Anadoluhisari on the Asian side of the narrow Bosphorus Straits. On the European side, Mehmet erected a stronger fortress called Rumelihisari. Gaining complete control of the straits, this would enable him to start his siege of Constantinople. The pair of forts gave the Turks complete control of sea traffic on the Bosphorus, preventing help from Genoese colonies on the north of the Black Sea from reaching the city. Byzantine Emperor Constantine XI, seeing Mehmet’s true intentions, turned to Western Europe for help. But centuries of war and hatred between the eastern and western churches took their toll. Constantine wrote to the Pope and pleaded for help. Pope Nicholas V did not have the influence the Byzantines believed he had over the western European Kings and princes. Some had become wary of increasing Papal power, and were also not in any condition to contribute to the effort. France and England were in a weakened state from the Hundreds Years’ War. Spain was carrying out the final stage of the Reconquista. German Principalities and their internecine fighting and Hungary and Poland’s defeat at the Battle of Varna in 1444 resulted in many leaders being unwilling to help Constantine. Some help did arrive from mercantile city-states in Northern Italy, and some Western individuals did come to help defend the city. Among them was Giovanni Giustiniani, a soldier from Genoa. He arrived with 700 armed men and was an accomplished specialist in defending walled cities. The emperor immediately gave him overall command of the defence of the land walls. Additionally, Venetian ships present in the Golden Horn offered their services to the emperor. To prevent a possible naval attack along the shores of the Golden Horn, Emperor Constantine Xi ordered a defensive chain placed at the mouth of the harbour. The chain, which floated on wooden logs, was strong enough to prevent any Turkish ship from entering. Another strategy Byzantines employed was the repair and fortification of the Land Wall. The land fortifications were included an 18-metre wide moat fronting inner and crenellated outer walls studded with towers every 45-55 metres. The defending army numbered over 7,000 men, 2,000 of whom were foreigners. The army’s Genoese troops were very well trained and equipped. The rest of the army consisted of soldiers, armed civilians, sailors and volunteer forces from foreign communities. Additionally, the defenders were well-equipped with a fleet of 26 ships. The rest of the city was tasked with repairing walls, standing guard on observation posts, collecting and distributing food provisions, and collecting gold and silver objects from churches to melt down into coins to pay the foreign soldiers. The Ottoman Army was larger. Studies and Ottoman archival data indicate there were about 50,000-80,000 Ottoman troops, including more than 5,000 Janissaries, an elite infantry corps. Estimates show the fleet Mehmet built to besiege the city from the sea consisted of 126 ships. Six large galleys, ten ordinary galleys, 15 smaller galleys, 75 large rowing boats, and 20 horse-transports. The Ottomans had the ability to cast medium-sized cannons, but the range of some cannons they deployed was far greater than the defenders’ expectations. Ottoman advances in arms production were greatly helped by a master founder named Orban. A cannon named “Basilica,” designed by Orban, was 8.2 metres long, and able to hurl a 272 kilogram stone ball over 1.6 kilometres away. Orban at first attempted to offer his services to the Byzantines, but they were unable to secure the funds he wanted. He left the city and approached the Sultan, stating that his weapon could blast “the walls of Babylon itself.” He was given ample funds and materials and was able to build the gun within three months in Edirne. The cannon was dragged to Constantinople by 60 oxen. It did have several drawbacks – it took three hours to reload, cannon balls were in very short supply, and it could only be fired seven times a day because of the time it took to cool down after each shot. Turks planned to attack the Theodosian Walls, a series of walls and ditches protecting Constantinople from an attack from the west – the only part of the city not surrounded by water. The Ottoman army encamped outside the city on April 2, 1453. The majority of the army encamped south of the Golden Horn. A commander named Karadja Pasha led regular European troops stretched out along the entire length of the walls. Troops from Anatolia were commanded by Ishak Pasha and were stationed south of the Lycus down to the Sea of Marmara. Mehmet erected his red and gold tent near the Mesoteichion, where elite regiments of Janissaries were positioned. Constantinople boasted around 20 kilometres of walls (Theodosian Walls: 5.5 kilometres; sea walls along the Golden Horn: 7 kilometres; sea walls along the Sea of Marmara: 7.5 kilometres): the strongest set of fortified walls in existence at the time . The walls had been recently repaired and were in good shape. This gave the defenders reason to believe that they could hold out until other countries sent help or until the Turks abandoned the siege. On April 5th, the Sultan himself arrived with the last of the troops. Due to the length of the city’s walls, the defenders decided that only the outer walls would be manned. 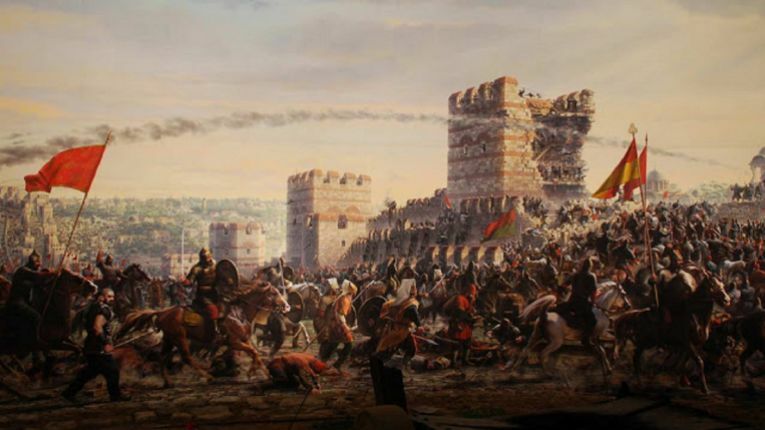 Picture shows rertored walls of Constantinople. At the start of the siege, Mehmet sent some of his best soldiers to capture the remaining Byzantine strongholds outside the city. The fortress of Therapia on the Bosphorus was taken within a few days, and Admiral Baltoghlu’s fleet captured the Princes’ Islands. The Ottomans’ massive cannon fired on the walls for weeks, but because of its imprecision and very slow rate of reloading the defenders were able to repair most of the damage after each shot. The Ottoman fleet could not enter the Golden Horn because of the defensive chain the defenders had laid across the entrance. The fleet’s primary task was to prevent ships from entering the Golden Horn. But on April 20th, four ships managed to slip in after fierce fighting. The event gave the defenders morale and angered the Sultan. To get his ships past the defensive chain Mehmet ordered the construction of a road of greased logs across Galata on the north side of the Golden Horn, and was able to roll his ships across on April 22nd. This presented a serious threat to the supply flow from Genoese ships from the colony of Pera and demoralised the defenders. An attempt was made on April 28th to destroy the Ottoman ships already in the Golden Horn using fire ships, but the Ottomans were ready and forced the defenders to retreat with heavy losses. Following these inconclusive frontal offensives, between mid-May to May 25th, the Ottomans tried to break through the walls by constructing underground tunnels in an attempt to mine them. However, with the help of a German engineer the defenders dug counter-mines, allowing Byzantine troops to raid the mines and kill Turkish workers. The first tunnel was intercepted on the night of May 16. Other mines were interrupted on May 21, 23, and 25 and were destroyed. The Byzantines captured and tortured two Turkish officers on May 23rd, and they revealed the location of all the tunnels, which were then destroyed. On May 21st, Mehmet sent an ambassador to Constantinople. He offered to end the siege if they gave him the city. He promised to allow the Emperor and all inhabitants of the city to leave with their possessions. Lastly, he guaranteed the safety of everyone who would remain in the city. In response to this, Constantine XI offered to pay higher tributes to the Sultan and said he would recognise the status of all conquered castles and lands in the hands of the Turks as Ottoman possession. But refused to hand the city over. Mehmet held a final war council with his advisors. One of them, Halil Pasha, who disapproved Mehmet’s plans to conquer the city, advised him to abandon the siege immediately. Another commander, Zagan Pasha, disagreed and called for an immediate attack. The Ottoman plan now was to overpower the walls by sheer force, believing Byzantine defences had been weakened by the prolonged siege and were worn out. The Turks started preparations for a final all-out offensive. Final assault preparations were started on May 26th. The Turks mobilised their manpower and prepared for the attack. Prayers and rest were granted to the soldiers on May 28th. The all-out offensive began after midnight on May 29th. The Turks performed their morning prayers and then advanced with trumpets, pipes, flutes, castanets, tambourines, cymbals and terrifying war cries. Three hundred years later this manifestation of Ottoman military music motivated Mozart to write some of his most moving compositions. Ottoman Christian troops attacked first, followed by wave after wave of irregulars known as Azaps, who were poorly trained and equipped, and troops from Anatolia, who focused on a section of the walls in the north-western part of the city. The cannon had damaged this section, and Anatolian troops were able to breach it and enter the city but were immediately pushed back. Finally, as the battle raged on, the last wave, the elite Janissaries were ordered to attack the city walls. Giovanna Giustiniani, the Genoese general in command of the land troops, was severely wounded during the Janissary attack. His evacuation from the ramparts resulted in panic in the ranks of the defenders. Guistiniani was taken to Chios, where he died a few days later from his wounds. Genoese troops abandoned their posts and headed towards the harbour to escape. Constantine and his forces were left to their own devices, and could not stop the Janissaries from entering the city. When the remaining defenders saw Turkish flags flying above a small postern gate, the Kerkoporta, panic ensued, and the defence completely collapsed. Venetians ran to the harbour to attempt to board their ships; many Greek soldiers ran home to protect their families. The rest of the defenders either committed suicide by jumping off the city walls or surrendered. It is said the Emperor led the final charge against the incoming Janissaries, dying in the ensuing battle just like his troops had in the streets. But Nicolo Barbaro, a Venetian witness to the siege, wrote in his diary that Constantine hanged himself when the Turks broke through at the San Romano gate. His ultimate fate is still not known. After the assault, the Turks fanned out along the thoroughfare of the city and past the Chuch of the Holy Apostles. Mehmet II had dispatched an advance guard to protect key buildings such as the Church of the Holy Apostles from looting. Venetians were able to board their ships and set sail; this was followed by a few Genoese ships and even the Emperor’s ship was able to follow them out of the Golden Horn. This was because the Turks were not interested in killing them and would rather secure the city. It was a close escape because the Ottoman Navy had control over the Golden Horn by midday. After the conquest, the Greek Orthodox Church was allowed to remain intact, and the Hagia Sophia was converted into a mosque. The capture of Constantinople gave the Turks a natural capital for their budding empire. The conquest sent shockwaves throughout Europe. The Pope called for an immediate response in the form of a crusade. When no European monarch came forward to lead the crusade he decided he would go himself, but his early death put an end to that plan. The fall of the city and Turkish encroachment in the surrounding region severed the overland trade route between Europe and Asia. As a result, Europeans had no choice but to try to reach Asia by sea. This was the reason for Columbus’s expedition and Vasco da Gama’s circumnavigation of India and Africa in 1498. The conquest of the “Queen of Cities” closed the Middle Ages, kickstarted the Age of Exploration and played a significant role in the discovery of the Americas by Columbus in 1492. Celebrations took place across Turkey today, the biggest one held in Istanbul’s Yenikapi meeting area. The event was attended by Turkish President Recep Tayyip Erdogan, Prime Minister Binali Yildirim, and Istanbul’s Mayor Kadir Topbas. The event consisted of four stages: the first stage was the reading of poems and a performance by the Turkish military band “Mehteran.” The second was a speech by Erdogan and other high-ranking government officials to the crowd, which numbered in the hundreds of thousands. The third was an air show by the “Turkish Stars.” The final part was a 3-D special conquest show billed as the biggest such show in the world.